So, I had the day off today and finally got around to playing with all my pictures from our trip to Walt Disney World a couple of weeks ago. DH and I took our first adult only trip and we had such a great time. Not that traveling with our now 19 year old is all that bad but it was really different just having to think about what two would like to do as opposed to three. I mentioned before that we spent a glorious day at Animal Kingdom and had a lot of Disney "magic" bestowed upon us that day. First off let me say that neither of us work for Disney or have any relationship to anyone who works for Disney. We just happen to love spending time at their parks and have over the past 10 years really grown to love Animal Kingdom. One of my favorite attractions at Animal Kingdom is the safari. I LOVE riding this attraction. The thing I like best is you just don't know what's going to happen because the animals are so unpredictable. We've had ostrich and rhino's walk right up to the truck. We've seen lots of animals and very few. My favorite time to ride this attraction is in the early morning. We've also found that when it's a little misty, the animals are pretty active. Late afternoon (around closing time) is another good viewing time. On the morning we were there we were picked as the First Safari Family of the day and got a private safari which was fantastic. Mainly because they slow down for you to take pictures and for a picture nut like me this is HUGE! To top it off you have a gu ide telling you about all the animals and their personalities and a wonderful driver to boot. This morning we saw a lot of aniamls. It was chilly for Orlando, in the low 40's but the animals were really out and about. We also did both of the nature walks this day and some of the photos on the collage are from those. I've had so many people tell me that when they visit WDW they don't bother with Animal Kingdom because "it's just another zoo, I can do that at home". Well to quote one of my favorite WDW Animal Kingdom commercials, Animal Kingdom is NATAZU (NOT A ZOO)! After riding our first safari and getting our "head of the line" pass for the rest of the day we headed over to catch Finding Nemo, The Musical. In what other theme park can you see a Broadway caliper show? I swear, I've been to Broadway production and this one has Broadway written all over it. The fact that they took the movie and condensed it down to a 35 minute show and didn't loose any of the story amazes me. The music, the performers and the puppetry are all just amazing. I have to say that while I admire and respect all the performers, there is one that stands out. After doing some investigating, I've f ound out that his name is Victor Chan. He is one of the performers who plays Crush. Again, while the other Crush performers do a respectable job, when Mr. Chan performs the show is just over the top. So, Mr. Chan if you ever see this let me just say in my best Crush voice, "you so totally rock Dude!" We bought the soundtrack for this show on our visit and now I can enjoy the music at anytime including Mr. Chan singing "G0 With the Flow" my absoluetly favorite number out of the whole show. In the 2 years I've been seeing this show his performance gets better and better and Disney is so lucky to have him along with all the other great performers in this show. Following lunch and one of our favorite spots to eat at Walt Disney World, Yak and Yeti's, we headed over to catch the Jammin' Jungle Parade. Ron, Cameron and I are Disney parade nuts. We've been known to sit and wait hours for a parade. Well, only once did we wait hours and that was for the last performance of the Electric Light Parade at Disneyland. We do however stake out our spot way in advance. We have a favorite spot for the JJP and so Ron and I arrived about 45 minutes before the parade so ensure we got our spot. There was a nice cast member standing nearby and we struck up a conversation with him while we waited. One thing I love about WDW is talking with the cast members. They are such an interesting lot and it always amazes me how many of them truly love their jobs. The parade was getting ready to start and he asked us if we'd like to stand in the VIP section because it was going to be empty that day. Of course we said yes, and moved to an even better spot than we had. Talk about a great spot. I think you can see from the pictures that we got a lot of attention from the characters. I love the one where I'm hugging with Chip and then Dale comes over and gets in front of me, that was fun! Then of course there is Minnie blowing kisses at Ron, I swear she is such a hussy and always flirting with my husband and now my grown son! LOL! Mickey really needs to put a ring on her finger and soon!! 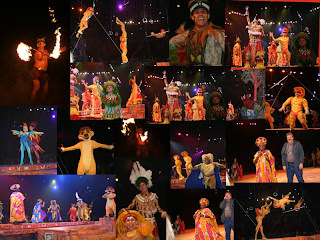 After the parade we headed over to see The Festival of the Lion King. 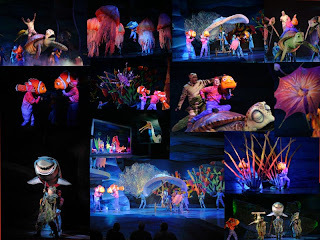 This show has been "running" for 10 years at Animal Kingdom and still fills up their huge auditorium every day for almost every performance. Yes, it's that good and yes, it was the show that prompted the Broadway production. 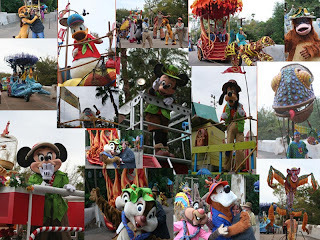 I love that they took the floats from the Lion King parade from years ago and used them for this show. BTW, Disney also took the "spitting" camels from the Aladdin parade (probably the BEST Disney parade ever) and is now using them on the Magic Carpet Ride at Magic Kingdom. How's that for reusing! Anyway, we got great almost up front seats for the Festival of the Lion King. Ron was picked as part of the audience participation to imitate the sound of the warthog. He did a great job and seemed to enjoy himself (pics in the collage). I love this show so much. The music, the artistry, the performers and all outstanding and it's no wonder it's been running for 10 years. It's a quality production and another reason why Animal Kingdom is my favorite of all the Walt Disney World Parks. What I love about some of these pictures is that because we were so close, we got some really great photos of the performers. I just can't help but smile when I see these people enjoying performing for all of us. To think that they do this every day, several times a day amazes me and they do it with fantastic smiles! 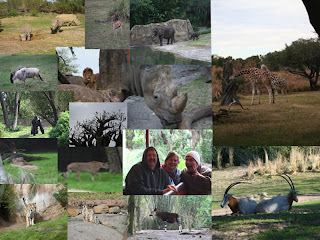 I'm so hoping that my post today intices you to visit Animal Kingdom the next time you are at Walt Disney World. Now, if you have small children I don't advise that this is your first park to visit BUT I do highly recommend this park for all ages. Another reason to visit, there are A LOT of character greetings in the park and usually the lines aren't nearly as long for the characters here than at other parks! Now, I'm off to stamp so I have something to post tomorrow!! Will you please contact me? btneils@comcast.net Thanks. What a fun time! Thanks for sharing the great pictures and your adventure. Disney is one of my fave vacations. Should you choose to accept, post a link to my blog and seven blogs of your choosing along with a picture of the award. Then you can just keep the award on your beautiful and inspiring blog.